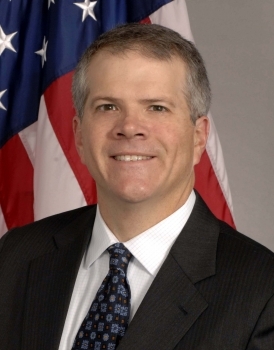 Bruce Andrews was confirmed as the Deputy Secretary of Commerce on July 24, 2014. Andrews was named Acting Deputy Secretary of Commerce by President Obama and Secretary Penny Pritzker on June 9, 2014. Prior to this, Andrews served as Chief of Staff to the Secretary at the U.S. Department of Commerce, a post which began in October 2011. Prior to joining Commerce, Andrews served as General Counsel for the U.S. Senate Committee on Commerce, Science and Transportation, where he served as the chief counsel for the Committee and was responsible for policy, legal and jurisdiction issues. Before joining the Committee staff, Andrews served as Vice President of Governmental Affairs for the Ford Motor Company, where he oversaw the company’s federal and state government affairs. Prior to joining Ford, Andrews practiced law as an attorney in the Public Policy and Telecommunications Groups at Arnold & Porter. He was also a founding member of the firm Quinn Gillespie & Associates (QGA), where he worked with clients on a variety of issues related to transportation, technology, judiciary, telecommunications and financial services. Andrews began his career on Capitol Hill where he served as Legislative Director for Representative Tim Holden (D-PA), Legislative Assistant for Representative Gus Yatron (D-PA) and on the staff of Senator Alan Cranston (D-CA). Andrews, a Syracuse, New York native, is a graduate of the Georgetown University Law Center and Haverford College. He, his wife and children live in Washington, D.C.